In Torment, we trade the heady atmosphere of the Georgia heat for the beautiful California coast. The narrative picks us up where Fallen left off, whisks us away from the familiar and sets us down in a whole new setting. Where Fallen saw Luce resident at the oppressive Sword and Cross reform school, in Torment she's packed off to the luxurious Shoreline, where the 'gifted' - nephilim - students follow their own special curriculum, and breakfast orders are served on the terrace. Despite the initial sense of disorientation, this relocation gives Luce - and the reader - a whole new environment to explore. There are new teachers in the form of Francesca and Simon, fallen angels from opposing factions who are also an item. And there are also new classmates for Luce, most notably her spirited tough-cookie of a roommate, Shelby, and dependable Miles, who is sweet as hell. As one half of an almost mythological love story among nephilim, Luce is not only counted among the 'gifted' and enrolled in their classes - she's also something of a curiosity, and not entirely comfortable with it. What she's also not entirely comfortable with is Daniel's absence. Because after delivering her to Shoreline, he makes himself scarce for reasons he can't quite explain to Luce - after all, if she hears about anything relating to their past from him, she'll spontaneously combust. She has to discover the truth for herself, and that's easier said that done. As in Fallen, Luce's progress in uncovering secrets is often slow - and for me, her attempts to find out about her past lives are both the most fascinating part of Torment, and the most frustrating. While Luce does discover her own ingenious way of looking into her history, it's also highly dangerous, and she's only ever able to uncover tiny morsels of tantalising buried past at a time. Not knowing that outside Shoreline, deadly Outcasts are gunning for her, she does seem to have developed an exasperating habit of straying into the path of trouble. But when nobody will tell her what the heck is going on, who can blame the girl? With all this going on, it's not surprising that Luce begins to question her connection with Daniel. 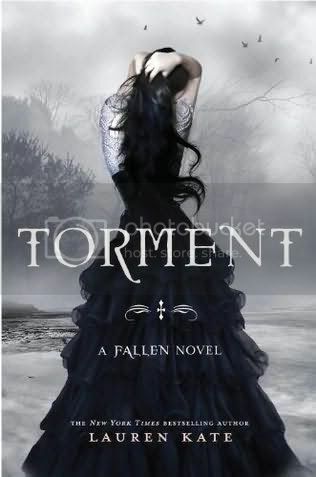 Unlike many YA paranormal romances, where the heroine seems ready to accept her beloved's flaws without question, Torment is a book that portrays the true complexity of relationships - despite the fact its central couple aren't exactly your regular girl and boy-next-door. Not only does she object to Daniel leaving her at Shoreline without him, but she's indignant at his assumption that he knows her better than she knows herself - especially when, as a teen in this lifetime, she's still finding out who she is herself. Can she even trust what Daniel has told her? And is her destiny really fixed with him? While the romantically-inclined reader will probably be shouting 'yes!' at the pages as they turn them, it's refreshing to see a YA paranormal heroine endeavouring to reach her own conclusions and trying to find a balance between being with her soulmate and holding onto her own identity. As you read Torment, it's clear that this is but one chapter in what's shaping up to be an epic story. The grand scale; the sense that even the tiniest detail may later prove to be of the utmost importance; the fact that every time one of our questions is answered we find ourselves compelled to ask another. The secondary characters lend a little quirkiness and humour to proceedings, although with a cast this large it's sometimes a little difficult to keep track of which is which - and what side of the celestial war they're fighting for. I'd recommend this to all those dedicated fans of YA paranormal romance who appreciate a tantalising slow-burner of a storyline - this one has an explosive conclusion, and will leave readers desperate to find out what happens next. Thanks for the review-- I am def desperate to know more. When the globe finishes there will certainly be a single Xbox; eyes as red as the fire she scorchings, standing solid with the mankind at her feet. Points like Xbox Live are very easy to obtain completely free as long as you locate a legit web site. At Plato's Storage room you'll locate a significant option of fashionable, developer designs along with those everyday essentials you can not live without - all at approximately 70% off shopping mall market prices!